Published by: Stone Arch Books in 2015 A Capstone imprint. Summery: She was once young princess on a secret island inhabited by warrior women known as the Amazons...but she left her homeland...and her royal birthright ...behind to become protector for the entire planet of Earth: Wonder Woman! This origin story shows how Diana who is the Queen Hippolyta's daughter is the heir to the throne of island of Themyscira. The island can not be seen on any map. The story tells how Diana earned right to leave island. It tells how Diana won contest between other amazon women to be Earth protector. It shows how Diana gained gifts from Hippolyta of special tiara, a pair of unbreakable silver bracelets. And The Lasso of Truth. To travel to places outside Themyscira , Diana uses an Invisible Jet. This way, no one will ever find the secret location of the Amazon's Island. The story tells how Diana arrives in the United States. She creates a secret identity for herself and gets a job. From the job she keeps a close eye on activities around the World. The story shows art how Diana transforms into Wonder Woman. She goes into battle against the God of war Ares who was causing violence and war in another country. Resolution is helped by Wonder Woman to help stop Ares from causing violence. Future villains turn up causing trouble like Giganta who can grow the size of a building. Circe an evil enchantress. She can turn people into animal. Her pets must follow her orders. Cheetah, is a master thief. She robs the First National Bank. Cheetah escapes. Wonder Woman captures one of her henchmen and uses lasso around him to make him reveal where Cheetah's hide out is. Cheetah is than no match for Wonder Woman. The story concludes saying that Diana of Themyscira is a princess and a warrior. But more importantly she is a champion for peace as well as justice. She is a super hero. The book concludes with two pages of Everything About ...Wonder Woman. It tells how Diana's tiara is also a throwing weapon. Diana's super-strength and fighting skills help her battle any foe. Her Lasso of Truth forces anyone caught in her grasp to tell the truth. Diana's bracelets are indestructible.Wonder woman is capable of flight. With super speed Dian can catch any enemy. Wonder Woman is DC comic book character. 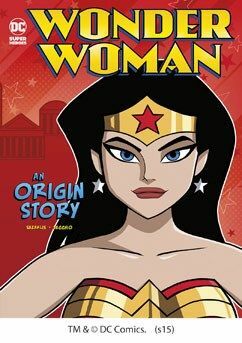 There is also page telling about author of Wonder Woman An Origin Story and also information about Illustrator. There is also a glossary page defining words high lighted in text of story. The final two pages are educational. Four images from story are shown with discussion questions relating to artists pictures.